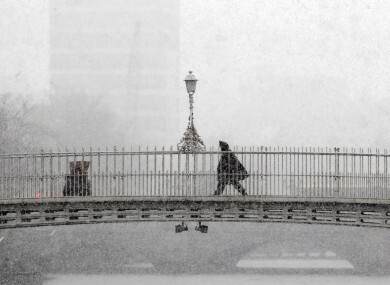 MET ÉIREANN IS warning that this week will see wintry showers with sleet and snow. Temperatures will plummet to below freezing tonight as the country moves well and truly into winter. Showers will start hitting the country today, growing tonight, with strong winds also expected. Tomorrow will be much the same, as showers continue to be scattered across the country. Wednesday will see heavier showers over much of the country, with freezing fog and severe frost expected for later in the week. However, we are due to get off lightly. Britain is forecast to be hit with up to six inches of snow in the next week. And, despite reports last week predicting a white Christmas, Met Éireann says that, scientifically, “it is not possible to make any confident forecast of the coming winter”. Email “It's going to get cold, but will it snow?”. Feedback on “It's going to get cold, but will it snow?”.